I know I expressed my love for carbs in my last post, but have I ever said how much I love veggies? Tonight I made an entire bag of Birds Eye Steamfresh Asian Medley vegetables. And you know what? I ate that whole bag, too. I know I talked about moderation and portion control, but this is arguably the only “meal” I make that I just can’t talk myself out of eating the whole thing. With the entire bag taking only 7 1/2 minutes to cook (in the microwave, may I add), amounting to 226 calories, 1360mg of calcium (360 over the FDA‘s recommended intake! 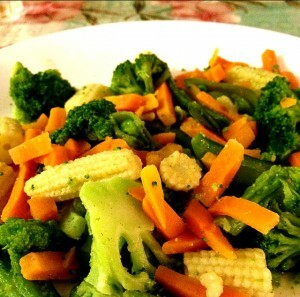 ), and 7.6g of protein, these veggies just keep getting better. Before I started writing this post, I was looking for the nutritional facts (since I accidentally threw my bag into the garbage already—whoops!) and stumbled upon reviews of the product on the Birds Eye website. I became curious about what others thought about this quick and easy “meal,” and I was honestly a little surprised and taken aback by the reviews. A lot of people complained that there were too many carrots, not enough of broccoli, and the broccoli pieces were too big. Looking at my dish, I saw where they were coming from. There were a lot of carrots, but…I like carrots. Why would I complain about that? If I didn’t like carrots, maybe then I would complain. But, then again, I probably wouldn’t buy a product that had carrots as one of the main ingredients. For me, the more carrots, the better! The broccoli pieces were pretty big, but all I did was mindlessly cut mine into smaller pieces, just as I do with any other dish I eat that includes broccoli. But I definitely wouldn’t say I didn’t get enough of it. If you don’t cut the florets into smaller pieces, you may only get 7 or 8 pieces, but after cutting, you’ve got half a plate full! The bag also comes with all of the carrots cut, so that’s why it seems like you’re getting a heaping plate full of carrots compared to broccoli. You’re welcome. Two reviews that contradicted one another: one woman complained “it tastes like there is a lot of sodium” while another was “beyond disappointed” with the taste and “finally doused it with some soy sauce to make it edible.” I think the taste is perfect. True, the dish may be a little dull if you’re expecting the broccoli to taste like it came straight from the Chinese take-out restaurant down the street, but the only way it could taste like it has “a lot of sodium” is if you had no idea you were buying the Asian Medley styled vegetables! Either way, the sodium-levels are a little high, but only if you eat the whole bag, like me. One bag contains 1344mg in comparison to the FDA‘s standards of a 2300mg daily intake of sodium. However, it’s still not as if you’re going over your daily intake levels with just one meal. Moral of the story? Don’t always listen to online reviews about products before you actually try them for yourself. Someone can highly praise a product that you think is disgusting or completely bash a product that is awesome (like the heavenly Asian Medley veggies). If I only read those reviews of this product before I tried it, I don’t think I ever would have thought twice about picking this up off the shelf. I picked it up because I figured hey, why not? If I don’t like it, I won’t buy it again. You’ve really got nothing to lose when it costs under $2 for a meal. I mainly go grocery shopping at my local Target, and when this brand goes on sale, I’ve noticed that the Asian Medley vegetables are always the first to go. So contrary to the mixed reviews, don’t be afraid to try the most heavenly vegetables you’ll ever eat. Your tongue and stomach will thank you for it. After all, you really have nothing to lose.